Giving yourself plenty of time to walk slowly using a penguin like walk in snow and ice. Spreading your feet out slightly while walking on ice can improve your balance. Look up weather conditions before you leave your house. When using stairs, it is especially important to use handrails and to keep your hands free by storing belongings in a bag or pack. You can also purchase snow spikes or traction cleats that can easily be placed on your shoes which can almost eliminate the risk of slipping (Please refer to the top link under References at the bottom of the page for some examples). Take time to be alert while walking on ice and snow. And always keep an eye out for black ice. Black ice is hard to see because it may look like a puddle or even dry ground. Be a defensive pedestrian. With winter conditions drivers can’t always see you and road conditions may not provide them with enough time to stop quickly and safely. Make sure drivers have come to a complete stop before crossing the street. Always stay on designated walkways. Also wearing a bright coat or scarf to be easily seen can help both during the day and at night. If you’re walking on or around campus during the day come prepared with sunglasses. Wearing sunglasses helps prevent eye damage from the suns reflection on the snow. Remove snow or mud from your shoes before entering any building. And enter buildings cautiously. Your shoes may be wet and can cause you (or others) to slip or fall. This can be especially dangerous on smooth tiles. Know your limitations. Carrying large packages or other items that limit vision can lead to slips and trips. Having your hands full can also decrease your balance. Keep warm clothes and a snow shovel in your car for if you get stuck and are away from help. Keep in mind that at times even taking the necessary precautions may not be enough and a fall could be inevitable. If you fall, relax and try to fall as limply as possible. Try to avoid landing on your knees, wrists, or spine. Try to fall on a fleshy part of your body, such as your side. Avoid using your arms to stop your fall. 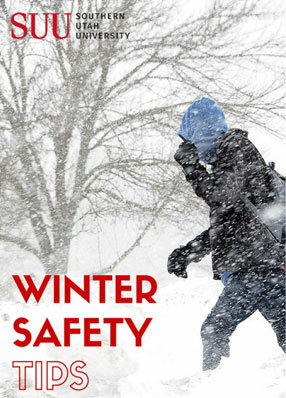 For more information about winter safety please visit: the National Safety Council.